You're going to hate this answer but.. any of the above will work plenty fine. 729 vs. 729FX - the latter is somewhat tackier and softer, might feel a little faster, but in the end plays about the same. CJ8000 - purportedly even softer, also tacky, but it won't make much difference if any. It does have a great drawback, search the forum for "CJ8000 dish" and you'll see, but if you're going to get the vendor to assemble the racket for you it won't apply to you. If you want to go crazy, I'll point out that there's also a 729-2, 729-3, 729-4, 729-5, 729-08, 729FX with black sponge, 729FX with big pore sponge, etc., and there's about a dozen and a half varieties of CJ8000. Good luck sorting all that out. You might also consider Yinhe 9000 (get them in the "no name" 2-for-1 packs, much cheaper AND lighter) and Yinhe Mercury II (both are in the $5 a sheet range if you look around). Get the blade and rubbers from the same "shop" on AliExpress (search the forum for "Eacheng" for an explanation - it's complicated.. ) and they should be willing to glue the rubbers on for you at no extra cost. Understanding Eacheng will help you save a few dollars... and pay attention to them coupons. The Sanwei M8 blade is a fantastic blade, regardless of what it costs. The Sanwei M8 comes preassembled with 729 rubbers in Aliexpress, this is fine right? Or is preassembled bad? Is tackier and softer better chop, top spin loop? 729-2, 729-3, 729-4, 729-5, 729-08 - do they really mean anything or they pull it out of thin air? is eacheng as reliable as Aliexpress? Aliexpress has a good refund record, eacheng website looks a bit untrustworthy to me(i know one shouldn't judge on appearance). With combos, I'll bet, if you get the right salesperson, you could probably get them to make changes - swap the rubbers for other rubbers (that are less expensive), etc. Or ask for a penhold version of the blade. Or get them to ship you the racket unassembled (I did this a couple of times when I won combos on their auctions on ebay). The combos, of course, cost less than ordering the blades and rubbers separately from the same shop, they're sort of a discount package. I haven't tried it but I'll bet you can make up your own combo (buy any blade and two sheets and ask them to glue them for you). They're all supposed to play differently from each other, and have gotten added to the catalog over time. Some of them have gimmicks ("Sensor technology", for instance, whatever that means). In the end, though, the differences are probably so small you won't notice. Most are in the next higher price bracket (plain 729 is in the $5 a sheet range in the Batwings packaging, most of the others including FX will set you back $8-12 a sheet) but aren't in the premier price range (about $20 a sheet, e.g. 729 Battle). My theory is that the rubber trade is so highly competitive, if you don't come up with a brand new rubber every year or so you're going to fall behind your competitors in sales. Andro's a great example (let's see what comes after Rasanter). Cobalt"]There's a couple decent bats around for that price. Can't remember exactly but it's called something like a yinhe 1A. I see there is a brand called Yinhe, no such thing as 1A. I need a bat which assists top spin and chop. These two are pretty much what I can play. Looked in my Yinhe catalog, there is indeed no 1A. However, there are 1B, 1C and 1D. (or rather - 01B,C and D) I've no idea why there isn't a 1A, maybe it was the penhold version and they dropped it. I know you can top spin and chop with it, point is can I? will it assist my game? I do chop very well right now, my forehand topspin or loop is extremely inconsistent, if I buy this bat and practice with it will it be good for me? 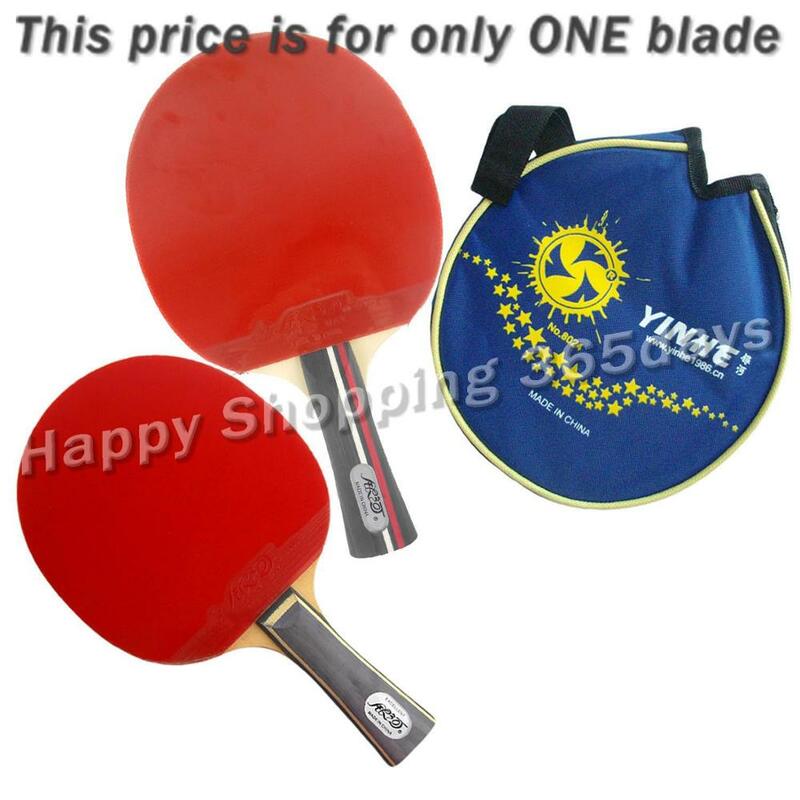 Please suggest any one of these, I feel like I'm going crazy reading all the info about table tennis equipment. 729 vs 729 Fx whats the difference? Which is more spinnier and which is faster? I'm planning on buying in aliexpress, the images of their bats shows various numbers like 1, 5 for the 729 rubber, what are these? Do they make any difference? is Sanwei M8 a good blade or should I go for the Friendship blade if Im going for Friendship 729 rubber? CJ8000 vs Friendship 729 vs Friendship 729 FX. which one of these should I go for? You dont have to buy same rubber for both backhand and forehand. It's a minefield. You honestly won't notice any difference between all those, even if you do, you want play any different. To put it in perspective, if a slow rubber is 1 out of 10 and a fast tensor Euro rubber costing $50 each is 10, all those rubbers you mention and most Chinese rubbers are 5.0, 5.1, 5.15, 5.20, 5.27 so there may be a subtle difference but will make little difference until you really develop your game and start looping or chopping well. Sanwei M8 sounds a good blade which is important as you can always change rubbers later. Just get that with whatever rubber but if given the choice I'd get something softer. Thanks everyone for your help and advice. I've placed an order for Sanwei M8 + 729 rubbers. Remember - even if in the beginning it feels totally too fast and too spinny, stick with it. Remember it's a beginner's bat, it's not something rocket-fast (even if it seems that way in the beginning), if beginners around the world can use it so can you. Watch some of the "beginner" videos on YouTube, practice with it and keep using it at least for the next six months without changing to something else. 729 OEM sheets are NOT as tacky as 729 SuperFX. Also topsheets of tacky rubbers will scuff and damage very very easily ! Keep a very very soft, clean wet sponge to wipe the topsheet should a lot of dust or dirt ever get on the rubbers. DONT use your shirt or towel on tacky topsheets !!! And definitely no wiping your sweaty palms on them either. Take care of your rubbers and bat and it should last more than 6 months looking like brand-new. That was my impression. FX is tackier than same-old. Not that tackiness is something to lose much sleep over, it will decrease over time no matter what you do - the only thing you can do to prevent it from going away is to not use the rubber at all.. My theory is that tackiness is applied to the rubber as an adhesive layer, carried by that "protective sheet" you peel off before you use the rubber. This adhesive layer gets gradually abraded off by the ball (and by all the other things we do to the rubber - wiping it with your hands, wiping it on your shirt, etc.). Some rubber is way too tacky to begin with and becomes usable only after you play with it for a short time. These tacky rubbers remain useful way after the tackiness is gone in any case. Hi everyone, I got the bat. It's Sanwei M8 blade + Friendship 729 rubbers. The red side had number 2 on it and the black side had number 5 on it. As I mentioned I was previously using GKI KungFu bat, in that bat I used to backspin or chop very well, my opponents would have trouble hitting my heavy backspin returns, but in this 729 rubbers, the ball is not backspinning as well, even my backhand and forehand loops are less spinny compared to GKI KungFu bat, my opponents are easily blocking those loops. But my smash shots are extremely faster now with Friendship 729. Is this how 729 will behave? or am I doing something wrong, should I change my action or something? GKI KungFu is that 500 INR / 8 USD? bat. It was my beginner bat with which I learned to play C-pen style after giving up on handshake. Pretty head-heavy pre-made, with non-tacky and semi-grippy rubbers. The sponge looks like a dish scrub sponge, very rough looking , and the topsheet not exactly shiny and with some surface defects. It compares in level as a Butterfly PanAsia ? or Wakaba rubber ? But definitely nowhere near Butterfly quality. You probably have not met any opponents with bats above 30 or 40 USD ( 2000 INR or above ) and also not likely to have exposure to high levels of spin. At best you are good at pushing returns or flat-smash returns or even passive blocks and counter-hit returns occasionally. If possible go buy a Butterfly Yuki-II pre-made bat or get gud so that you can start using your Chinese-style custom-made racket later on. Sorry if my advise is not what you might have expected. I hope you continue to play with the GKI KungFu. Its not terrible or unplayable. After a certain level you can still pickup the M8 with 729 rubbers and develop your game. But first get your strokes and movement drilled with the KungFu. Learn to loop and block the maximum possible with it. Don't worry about pushing and chops just get very consistent at it means not even a single error in 20 chop or push returns. Once you maxed out on the GKI KungFu, then go to the M8 + 729 rubbers. M8+ 729 requires a more open bat-angle, faster upward stroke, a MUCH firmer contact and full brush on the ball ( maintain ball+rubber contact, increased dwell by brushing heavily). Ball will not sink in easily into the rubber, and just a little bit too much force will make the loop fly too long. So 729 rubbers are not very forgiving if your strokes are not consistent. Pushing and chopping requires some wrist action. Chinese rubbers are notorious for being "dead" or non-reactive when playing soft/touch shots. So always put a little bit of wrist to activate the rubber. And also, Euro- or Chinese- style of TT play isn't too different Zhang Jike and Wang Liqin are probably European-style TT players Can someone analyze and confirm that ? Or am I mistaken ? "Passive shots is less deadlier" for 729 compared to Kungfu is normal, because 729 are both very sensitive to incoming spin and almost impossible to bottom up, means no return opponent spin like Tackiness Chop return, backspin "spin" dictated more by your own chopping speed. And, because 729 wa~y slower than typical Japan or Euro rubber, more of Your topspin speed is "translated" to ball spin rather than ball speed, enabling you to hit a lot faster without worrying that the ball would go long, which the same stroke with Euro rubber shall send the ball beyond the table. This what commonly mistaken as "A lot faster smash." In my case, I need 16 hours worth of training to adjust from Tack Chop 2 to H3, and worth it. I think we're getting waaaay ahead of ourselves, discussing Chinese vs. European styles, etc. The guy's a beginner. If he's not getting the backspin it's probably because the 729 is quite a bit faster than the rubber on his Kung Fu bat, he just needs to learn the right strokes and how to hit the ball properly. When he gets up to 1500-1800 level then all this stuff will make a difference.